Frank Buonanotte, founder and chairman emeritus of The Shopping Center Group, and Jeff Stein of Stein Investment Group have partnered with Eden Rock Real Estate Partners on the Westside Village development. He said the project is coming to an area with the state’s highest annual household income. 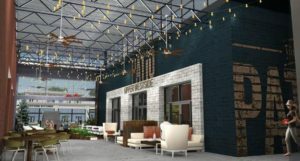 It sits between established neighborhoods including Peachtree Battle and West Wesley and a cluster of new home construction that’s bringing thousands of Millennial families. About 1,700 new homes are under construction within a half-mile of the project. The project is re-purposing a 50,000-square-foot warehouse and adding three commercial buildings. It will also include about 20 townhomes.